This is a ballet score by the Chilean composer/conductor Jose Luis Dominguez. Somebody needs to hire this guy for a film, and fast. Incredible music. There was a 1960s bio-pic set in Central or South America concerning a character of the same name the title of which in the UK was exactly as listed here. Would need to search deep into my files for this one, but could it be regarding the same individual? CORRECTION TO LAST POSTING-or extra information even! Maybe both were histories regarding the same leading character and events? The television movie western "Desperate Mission" was produced by 20th Century Fox in 1969. It starred Ricardo Montalban as Mexican bandit-folk hero Joaquin Murieta. 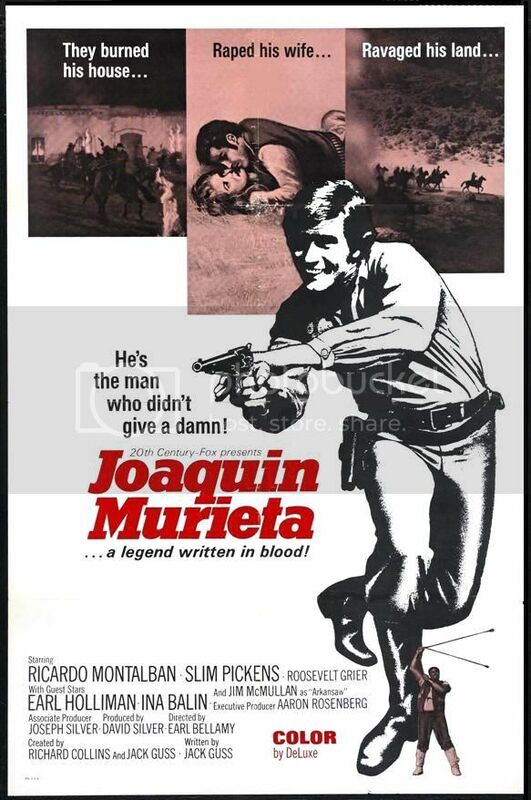 But instead of being shown on television, the film was first exhibited theatrically outside the U.S. in late 1969 and 1970 under the title JOAQUIN MURIETA. It finally aired under its original title on NBC on 3 December 1971. Sources differ on who scored the film, with both Robert Drasnin and Jerry Goldsmith being named. 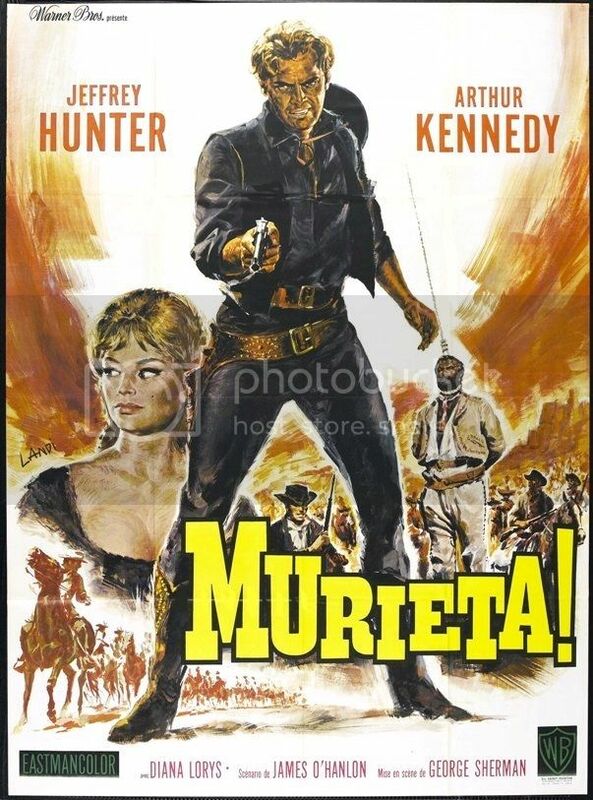 I have a dye-transfer print of the 1965 film MURIETA with Jeffrey Hunter and Arthur Kennedy. I actually thought I was buying a print of VENDETTA with Faith Domergue but this was a British release version of MURIETA titled VENDETTA. I had never heard about it but it turned out to be a very good film, directed by oater veteran George Sherman. Warner Bros. distributed this Spanish production in the U.S. and selected foreign markets. I've spun this intermittently over the past two years and every time I do, I'm blown away all over again (if slightly daunted by the sheer length of the thing). This is a phenomenally filmic, lush, exhilarating work, basically a film score in the best traditional sense, albeit written for the stage instead. It doesn't reinvent the wheel per se but it's done with such enthusiasm, panache, diversity/breadth of thematic material... Just damn fine craftsmanship beginning to end, tuneful and memorable and all things good like "they used to be". Heroic main theme of a distinctly Silvestri-esque cloth? Check. Beautiful Rozsa-esque love theme? You bet. Immediately catchty and entertaining bad guy motif? Hell yes. A wealth of great set-pieces and secondary ideas throughout? Yes and yes. Lengthy, elegant solos from the orchestra amidst the larger blood-and-thunder music? Goodness yes. Everyone's given a moment to shine in this work. I'd very much love to hear more music from Dominguez, who I understand works principally as a conductor. He's got real talent for crafting a superb, cinematic sound that harkens to the traditions we all love without being overly beholden to them. It's a shame the few responses this thread amassed are mostly about film adaptations of the titular Murieta's life and have nothing to do with this monumental work from an unheralded composer. You talked me into it. After listening to the samples, I agree. This sound like something I would like. Ordered it. Having completed a few shorter pieces and a number of especially commissioned orchestrations, in late 2008 Domínguez decided to devote himself to creating a large-scale symphonic work that would satisfy his compositional curiosity. Initially he thought of this project as an “exercise in orchestration” but, inspired by his work with the Santiago Ballet Company (the Teatro Municipal’s resident company), he chose to write a full-length classical ballet, allowing him to experiment with the timeless technique of the leitmotif, among other musical resources. Domínguez was keen for his score to work as a stand-alone piece, without the choreography, which is why he drew on the genre of the film soundtrack for inspiration – not the kind of assembly-line incidental music so widely used in the industry today, but the great symphonic tradition of film music as represented by John Williams and Bernard Herrmann, or by Erich Wolfgang Korngold, Max Steiner and Miklós Rózsa, all of whom were trained in the classical European tradition. As he began work on both the score itself and the plot, he initially thought of basing his ballet around the fictional character of Zorro, star of dozens of stories, films and TV series. While this is very much an “action ballet”, however, Domínguez changed his mind during the composition process and decided to centre his plot on the historical figure seen as the main inspiration behind Zorro, the nineteenth-century Californian brigand Joaquín Murieta. I just listened to the samples. That's the best non-film film music I've heard in ages. I'm going to get it. Woo hoo! And we have some converts! Enjoy, people. This one's really damn good!